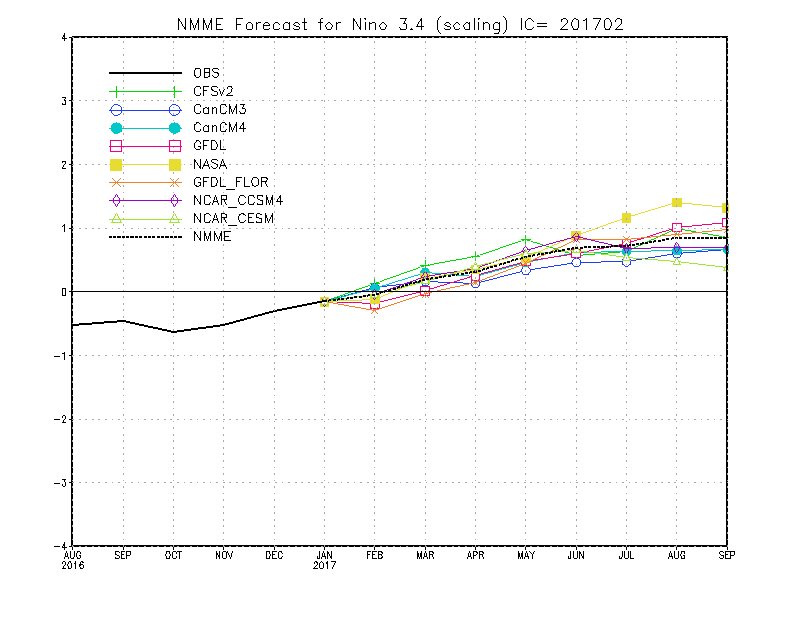 Nino 3.4, NMME, Combination, CFS2 and UKMO Tropical N Atlantic latest plot. Click image for details. FINAL FEBRUARY UPDATE 270217. Initial March update due 030317. Not available India Met Office IMO, South Africa Weather Service (SAWS) LRF. (Data date shown as ddmmyy). Summary -160217- Consistent signal for above average temperature for the season and each month. Hints that March may only be a little above normal especially in W and locations for above normal vary for April and May with western areas nearer normal in April and eastern ones in May - detail which is not reliable. Rainfall signal for above normal in March except perhaps the NE of Scotland which might be near or below average. Near normal in April locally below normal. 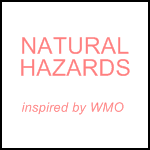 May also near normal but risk of above in the N and perhaps the W (e.g. Eire, parts of SW and Wales). Pressure near normal at times below normal but less likely later in season. UKMO Contingency 270217 - UKMO comment - Chance that Stratospheric Warming may bring drier and perhaps colder types for a time later in March or in April after westerly types predominate for much of March. (Note by Mike - Polar Stratospheric Vortex has been displaced East to the N of Russia with persistent NW flow over UK area weakening. Could lead to colder northerly types after mid month). MAR to MAY: Strongly shifted distribution to above normal (UKMO probs for 1 in 5 year warmest around 40% compared to 20% typical). Estimated probs from plot: for below normal around 10%, 20% normal and 70% above normal. MARCH Slightly higher probs for above normal than below due to main cluster being slightly above normal and second largest cluster being below normal. MAR to MAY: Perhaps slightly more above normal solutions than below normal although there is perhaps more clustering around the near normal or slightly below normal. No clear signal. BCC China BCC CSM1.1m Second generation coupled model. 24 members. Atmospheric component is BCC_AGCM2.2 at T106 horizontal resolution (about 1 degree) and 26 vertical layer. PPN : Mixed signal for normal or above but in E of UK similar probs for above/normal/below. Parts for W Wales and SW England have slightly enhanced probs for well above normal. PSML: S of UK has reduced probs for above normal. Mostly near normal UK and Eire but with chance of below normal in Scotland. Meteorological Service of Canada, CanSIPS forecasts are based on a 10-member ensemble of forecasts produced with each of two CCCma climate models for a total ensemble size of 20. Hindcast period 1981 to 2010. CanSips is included in the NMME. 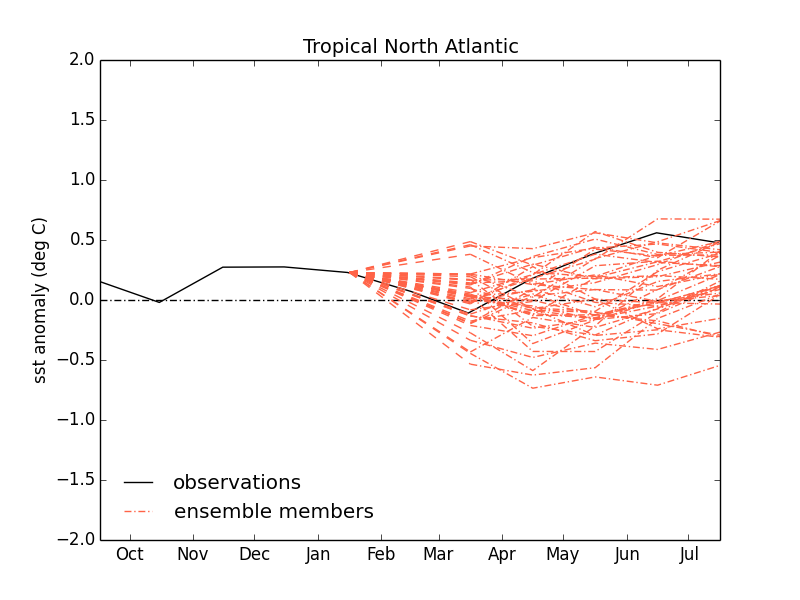 PPN: season - Above normal especially in western half of UK also Eire. Note the wetter month looks to be March on the month to month data with near normal in other months. PPN : Mixed signal but in E of UK increased probs for below normal and a chance that the S and E of UK may be below. MAY N half Scotland and far E England normal elsewhere above JUN N Ireland, NW and SW Scotland below elsewhere normal JUL Most of England and Wales normal elsewhere below. MAY above normal JUN normal but below in N Ireland and Eire JUL normal but below in E Eire, E of N Ireland, S Scotland N and NE England Wales and far W Midlands. PPN : Mixed signal for above/normal/below but chance that Wales and S of UK is above normal BUT similar probs for well above and well below normal in S of UK which might imply short spells of heavy rain with also drier spells. (Summer thunderstorm type rain unlikely to be captured by climate models). Summary - 160217- Above the 1981 to 2010 average is most likely with anomalies up to 1C indicated. N and W slightly lower anomalies for season but in August in the N hints at stronger anomalies in parts of N Scotland but elsewhere slightly less strong anomalies. Rainfall may be above normal in the S of UK in June then this risk may shift to the N and NW later in June or early July. Part of July and then August may see below average rainfall in the S and SE of UK and in August for SE Eire too. Temp: Season 50% prob for above normal 60% in North. PPN: season - bit mixed season may be below in S and SW, monthly detail of late has been unreliable but suggest drier July and Aug in S but drier June in N.
PPN: Season: normal but above in SW England and Scotland except the NE and SE. 1. NORMAL=typically the model normal based on historic runs rather than the measured normal from observation - hence trends rather than numbers are a better guide. 2. CFS2 monthly and seasonal anomalies hindcast period 1982-2010. 3. CFS2 weekly anomalies are with respect to the lead dependent model climatology from the hindcast period (1999-2010) without any adjustment - a very warm decade!. 4. UKMET The hindcast period used for model normal is 1996 to 2009. 42-member ensemble seasonal forecast (120KM res over land) combining and bias correcting all forecast members available prior to issue. 6. NOAA GFDL FLOR – 50KM resolution - Forecast­oriented Low Ocean Resolution version of CM2.5, substitutes 1­degree ocean for the 0.25­degree. 7. NMME data, please see the BAMS article (Kirtman et al. 2014). The NMME project and data dissemination is supported by NOAA, NSF, NASA and DOE with the help of NCEP, IRI and NCAR personnel in creating, updating and maintaining the NMME archive. KEY: UKMO=UK Met Office KMA= Korea Met Agency JMA=Japan Met Agency Russia=Hydrometcentre of Russia NOAA=main US climate data model used by Climate Prediction Centre. Other N America data also used e.g. NASA and IRI. CMA=China Meteorological Administration. 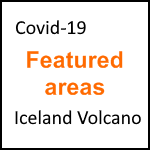 GFDL Geophysical Fluid Dynamics Laboratory. CMC=Canada Met Center.